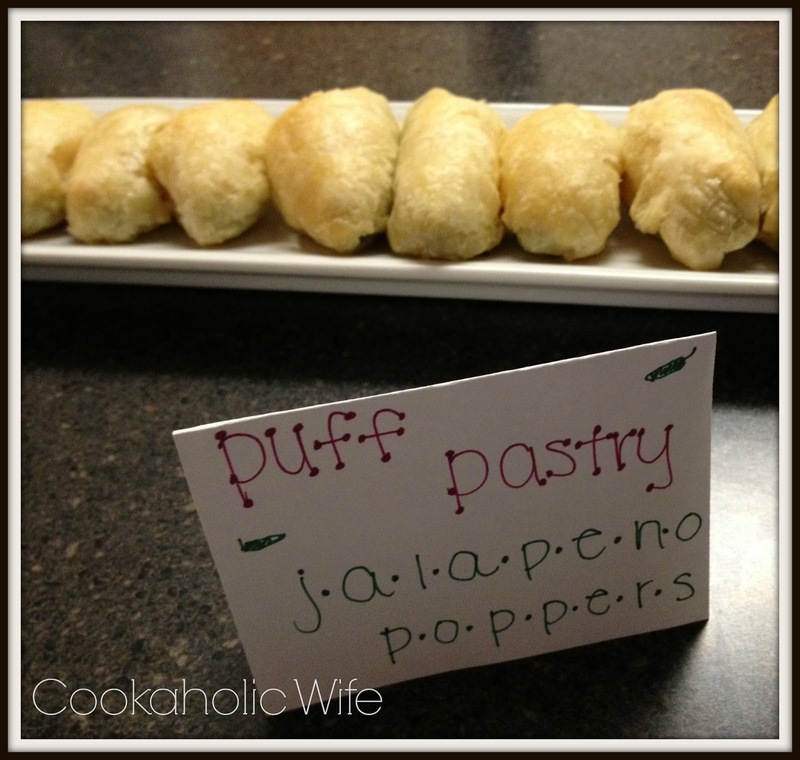 Jalapeno poppers are one of my favorite snack and party foods. Obviously, since I’ve made these stuffed jalapenos and these bacon and cream cheese jalapeno bites. If it weren’t for the need to blog new foods, I’d easily make a variation of jalapeno poppers for every party I have and every holiday I host. Lucky for you, I guess, I feel as though I should provide you with a variety of appetizer options to choose from, should you be perusing that section of my blog. But when I planned the Cards Against Humanity party, I knew I wanted mainly finger foods and jalapeno poppers are just that! While the two other versions I’ve served have just used the jalapeno for the shell, I was drawn to these because of the use of puff pastry. This made them most like the ones you’d get from your local restaurant or sub shop. 1. Preheat the oven to 400 degrees. Line a baking sheet with foil. 2. Unfold both sheets of puff pastry and cut each into 12 3×3 squares, making 24 total squares. 3. In a bowl, stir together cream cheese, cheddar cheese and bacon. 4. Fill each jalapeno half with the cream cheese mixture. Place each jalapeno on a piece of puff pastry and wrap the puff pastry around the jalapeno. Place on the prepared baking sheet. 5. In a small bowl, whisk together the egg and water. Brush over the poppers. 6. Bake for 20 minutes or until golden brown. Serve immediately. I loved these and found them to be much better than the stuffed versions I tried. The puff pastry gave a nice flaky crust that took away some of the heat from the jalapeno. One of my friends must have gotten a particularly hot jalapeno though because she said hers was really, really spicy. This is so clever. 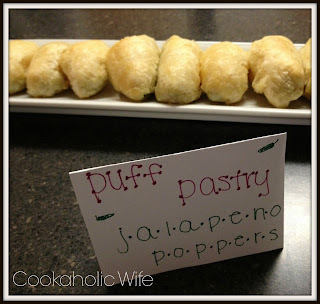 I'm not a huge jalapeño fan, but wrapped in puff pastry would tempt me! Thanks for sharing.